Congaree National Park is one of the most marvelous National Parks. It has tons of interesting history and fun facts. They even have some world record breaking trees! You will find that as you read these paragraphs Congaree’s land is truly fascinating! In 1540, Hernando De Soto, a Spanish explorer, crossed the Congaree lands to explore. He recounted how intrigued he was in his journals. In 1974, Congaree Swamp National Monument was designated as a national natural landmark. In 1989, hurricane Hugo hit Congaree forest and took down several champion trees. Congaree National Park was designated on November 10th, 2003. That tells you a little bit about Congaree's rich history. In 2003, the name of Congaree Swamp National Park changed to Congaree National Park. This new name allured way more people to visit. Congaree National Park lies along the Congaree River in Central South Carolina. It covers 24,180 acres of land. That is a titanic amount of land! It is a floodplain forest that floods about 10 times a year. 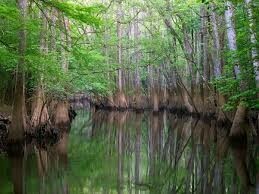 Congaree is not a swamp because it does not contain standing water throughout most of the year. There you go! Thanks for reading about the area in Congaree! Number 1. Congaree has a Swamp fest every year. Number 2. If you like camping you should definitely consider coming to Congaree National Park to camp! Number 3. If you like or love to go fishing then you can just come to Congaree to fish in their fantastic lakes! Number 4. If you’re worried about the heat or humidity then you’ll be happy to hear that the typical climate in Congaree is in the 70’s with low humidity. Number 5. The record for the lowest temperature in Congaree is 9 fahrenheit in 1996. Number 6. The record for the highest temperature in Congaree is 104 fahrenheit in 1999. Thanks for reading some fun facts about Congaree National Park! Did you know that the Lobolly Pine Tree is one of the most alluring natural wonders in Congaree National Park? The Lobolly is about 167 feet tall (16 stories) and 15 feet wide. That is titanic in size and the tallest tree in Congaree National Park! This is a picture of a river in Congaree National Park. These trees' are part of what makes Congaree National Park beautiful. 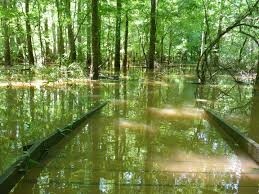 This picture represents how Congaree floods a lot. One day while Lobolly Pine was taking a nap, he heard a big “THUMP!” he was curious to know what it was so he turned to ask mother Lobolly. Once he turned he saw that there was Vivi and her coterie of witches cutting down all of the trees and he knew that it was soon to be his turn. When they got to him he begged with all his might. “Please oh please don’t cut me or any of the other trees down!” he pleaded. “Why should we listen to you?” Vivi said. “Because I have family and friends who look up to me!” He said back. “Fine, but instead of cutting you and every body else down, I will make you be the tallest tree in the forest!” Vivi said. At the time this sounded wonderful to Lobolly Pine. “I accept.” All of the sudden he felt his roots and trunk start to expand. “Bye mother Lobolly! Bye father Lobolly!” he yelled. As he grew the image of his parents became faint. Soon their images became so faint that Lobolly Pine could not see them any longer. When the growing finally stopped, all of the other tree's branches were covering the ground below so he could not see or talk to anyone. "I guess being the tallest tree isn't the best after all." Lesson: Being greedy won't bring good blessings. That shows you that Congaree National Park is one of the most marvelous National Parks!